By this point, everyone has heard that exercise is good for health. The fitness industry has been growing significantly over the past decade. As of 2017, there were more than 200,000 health and fitness clubs worldwide, which is up from nearly 130,000 clubs in 2009. Clearly, fitness is becoming a huge part of peoples’ lives. But why are we seeing this massive growth in the industry, and in what ways is it improving health? The physical benefits of increased activity include the following. A well-known benefit to working out is increased muscle mass. This alone has so many benefits to your health besides the visual appeal that people seek. Muscle is a huge driver for metabolism. In fact, it takes so much energy to maintain muscle mass that having more of it increases metabolism significantly, even at rest. Most people hit peak bone mass in early adulthood. After we hit our peak, our bone density begins to decline. Several factors go into how much we build before we hit our peak and how fast we fall once over that peak. And of course, exercise is a huge factor in this. Weight-bearing activity that forces you to challenge gravity is huge in preserving or even building bone density by breaking down the bone so it can build back even stronger. Exercise can improve sleep quality by expelling built-up energy. Another way sleep improves is the cycle of body temperature brought on by exercise. During activity the temperature increases; once activity has stopped the temperature gradually decreases, causing chemicals to be released that promote drowsiness. In the short term, exercise increases blood flow throughout the body to improve energy. Over time, exercise causes improvements in cardiovascular health, allowing the heart to pump more oxygen-rich blood throughout the body, therefore increasing energy. When exercise, weight loss, and dietary intervention are combined, the LDL (bad) cholesterol levels decrease while HDL (good) cholesterol levels increase. If you’ve ever heard the phrase “exercise is medicine,” it will be no surprise that exercise actually reduces the risk of chronic diseases. Various things happen in the body to cause this, but the most important is that by getting active, the chances of developing Type 2 Diabetes, some cancers, stroke, heart disease, and more are drastically reduced. By staying active, people learn how to be more coordinated and balanced. Motor control over movements becomes more natural the more it is practiced, and will translate to real-life scenarios. In the long run, especially through aging, this is beneficial to help prevent falls and the negative consequences, such as fractured bones, that come along with them. The mental benefits of increased activity include the following. Most of these improvements occur due to the increased blood flow to the brain, which acts on the hypothalamic-pituitary-adrenal (HPA) axis. This area of the brain interacts with several other regions, including the limbic system, hippocampus, and amygdala, which are correlated with motivation, mood, and responses to stress. Other noted improvements may be explained by providing distraction, improving self-efficacy, and increasing social interaction. Research shows that exercise can improve cognitive function by promoting neuroplasticity. By staying active throughout adulthood and senior years, cognitive decline can be prevented. Although many mechanisms go into this complicated process, one thing that is known is that the rate of neurogenesis, or the production of new neurons, is greatly increased by exercise. This may be the result of increased blood flow to the brain during exercise, with an abundance of oxygen and nutrients. 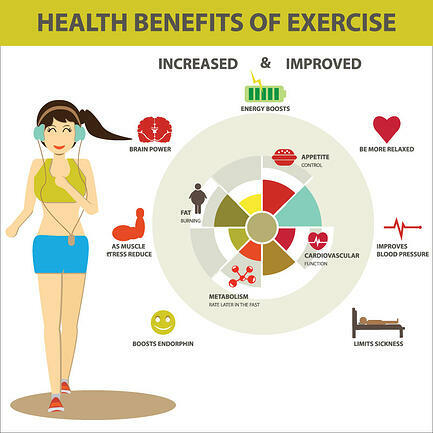 A lot of benefits that come from exercise can be measured or researched. Some benefits are harder to measure but still occur. We learn how to set realistic yet challenging goals, learn the discipline needed to accomplish those goals, and learn more about ourselves. We can gain a better understanding of how much we can push ourselves and improve our mind-body connection. The current Physical Activity Guidelines for Americans outlines the recommended amount of activity for different age groups. Adults should do at least 150 to 300 minutes of moderate-intensity aerobic exercise, or 75 to 150 minutes of vigorous aerobic exercise a week. Most health benefits can start to be seen at the minimum amount; however more benefits are seen beyond 300 minutes of activity a week. Adults should also do some type of resistance-training exercise at least two days of the week. At NIFS, we have multiple group fitness classes every day to help you reach your goals and hit the minimum requirements. 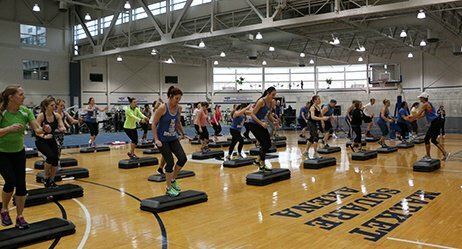 Check out the group fitness schedule for 30–60-minute classes to help you achieve at least 150 minutes of exercise a week. This blog was written by Hannah Peters, BS, CPT, Health Fitness Instructor. To learn more about the NIFS bloggers, click here. After the New Year, springtime is another time that motivates us to make a fresh start. When the weather finally starts to warm up and the breeze is blowing, we want to throw open the windows and let the rebirth all around us revitalize our homes and our spirits. Because it’s only natural to clean out the old during this time of the year, it’s also a great time to come to terms with your excuses for not getting fit and healthy. Excuses pile up just like the clutter that people accumulate in their houses, but it’s time to come clean. What Is Your Excuse for Not Putting Your Health First? This is probably the most common excuse that we hear. You are too busy. You have work all day or all night; you have to take the kids to school, pick them up from school, and take them to sporting events; dinner needs to be cooked; who’s going to go to the grocery store; and so on. One of those excuses, if not all of them, is something even fitness professionals deal with on a regular basis. However, if you do not exercise, you will almost certainly begin experiencing the illness and disease that come from an inactive lifestyle. When the symptoms start to present themselves, you will have to schedule a doctor’s appointment, drive to the appointment, wait to be seen, schedule possible additional tests at the hospital, and wait for your prescriptions to be filled at the pharmacy. With chronic illness, this scenarios will be played out month after month after month, into a vicious cycle. And that, my friends, can take even more time than exercising. There’s no doubt we find time in our busy lives to attend to our medical issues. Will you make time for them? Well, of course! It’s easy to make sure to adjust your schedule and your life to accommodate illnesses. So why not just adjust your schedule now to accommodate the prevention of these illnesses through exercise and lifestyle change? The truth of the matter is that if you do not make time for exercise, you will have to make time for illness. And let’s be honest, exercising takes a lot less time out of your life than sickness. Do the math: there are 24 hours in a day = 8 hours of work and 8 hours of sleep, and there are still 8 hours left. You can do a great deal in 8 hours. I don’t like to exercise. Do you like feeling tired? Do you like having no energy? Do you like being overweight or not healthy? Do you like visiting the doctor? Or undergoing medical tests to figure out what is wrong? You will feel tired, be overweight or unhealthy, visit the doctor more often, and undergo medical tests if you continue to let your lifestyle decline by not exercising. I don’t have any energy to exercise. The more unfit you are, the less energy you have. When you don’t have much energy, the last thing you can imagine yourself doing is exercising. Until you become more active, you will not have the energy you are longing for. As you begin exercising, you will start to see a difference in your energy levels. Until you start moving, you won’t start feeling better. I get some better clothes. My work schedule calms down. The list can go on and on, but in all honestly, it will never be the right time to start a new routine. Start now and make it right! Making the decision to stop hiding behind your excuses is something only you can do. But by making a clean sweep and tossing out those excuses, you are setting yourself up for a better and healthier lifestyle. 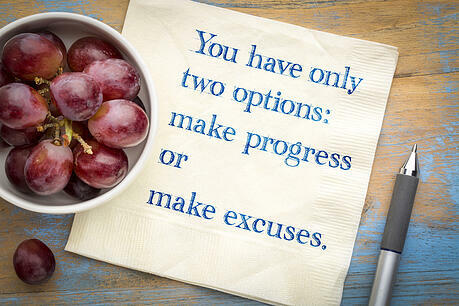 The fit and healthy people around you choose to give up the excuses and just do it. I’m not saying it’s easy for them, that it’s easy for me as a fitness professional, or that it will be easy for you. But what it does mean is that you will love the feeling of having energy, feeling strong and healthy, going to fewer doctor’s visits, not to mention feeling motivated and empowered to continue to push and get it done. Imagine a tightrope walker, gracefully walking their path across their suspended highwire. An incredible amount of balance is required, along with stability and strength, to ensure that the performer maintains their position on the rope. Now think about balance as it applies to you and your profession or daily life. You might not even think about it, but you use balance every day. Things that you take for granted, such as walking down stairs, putting on a pair of pants, and getting out of your car require some level of balance, or else we would most likely take a tumble. Thankfully, there are exercises and routines designed to improve and train balance that transfer nicely to daily life. As with any limitation or injuries, be careful and mindful of the doctor’s recommendations. Loss of balance could be a sign that you need to be checked out by your physician. That being said, we know that exercise can be great, but we would regard and yield to the utmost safety when approaching anyone who may be at risk or falling due to balance issues. If you have come to the conclusion that your balance needs help, there is good news for you! Like most facets of life, balance can be improved. The answer to a question as simple as, “If you want to run a 5K in 20 minutes, what would you do?” is RUN! So, if you want to get better balance, what should you do? Practice balancing. You do not have to walk a tightrope on day one, but there are many exercises and fitness tools designed to help your balance improve. Try the following exercises and activities, and see how you do with balance, then incorporate them into your routine. Assess your balance from time to time to see how you have improved. Stand on an unstable surface. Using an AirEx Pad, time yourself standing on one foot. Other exercises can be done while standing on the pad such as lunges, squats, and dumbbell overhead press, utilizing the unstable surface to challenge your balancing ability. Other unstable surfaces you may use as you advance include the BOSU ball, half foam roller, and sand. Try unilateral exercises. 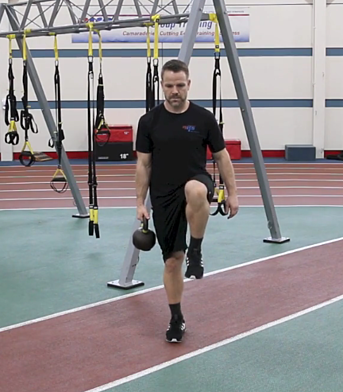 Improving your leg strength through unilateral exercise is another great way to improve your balance. Some examples of these exercises include lunges, split squats, and my personal favorite, the single-leg sit and stand on a box. For this exercise, you will want to find a box that is the appropriate height (around chair height). Start from a seated position, then come to a complete stand using only one leg. Try to sit back down onto the box under complete control. This can be progressed with weights and movement patterns such as the overhead press. Join a group fitness class. Another way to improve balance is through group fitness classes. NIFS offers several classes that emphasize balance, such as BOSU conditioning and some that help you develop balance such as yoga and BODYCOMBAT. As stated above, the more you practice your balance, the better chance you have to improve it. In BOSU conditioning, we can progress and regress any exercise to fit your needs. The exercise doesn’t have to be impossible, but it should be challenging. Check out this NIFS blog by our own Tony Maloney for more about BOSU balance. With the improvement of balance comes an overall improvement in your quality of life. Being able to trust your steps as you walk is important, as is being able to do things in life you love to do. Getting better is just a process and takes time. You must take that step forward; otherwise, you might be on shaky ground. For tips and exercises to promote balance, contact a Fitness Specialist at NIFS or join one of our many group fitness classes. The never-ending cold and dreary winter weather is coming to an end finally. After months of staying in and hibernating on chili, casseroles, soups, and stews, it’s time to break out the fresh and colorful foods! This is the perfect time of year to experiment with more fresh fruits and vegetables that are quick and easy and oh so good for you! Here are some of my favorite recipes that I am excited about adding into the spring and summer rotation. In a large bowl, toss together the Brussels sprouts, bacon, pecans, and grated Parmesan cheese. In a small bowl, whisk together the lemon juice, maple syrup, olive oil, shallot, and salt and pepper until thoroughly combined. Pour the dressing over the salad and toss to ensure that all of the ingredients are evenly moistened. The salad can be served immediately, or refrigerated for up to 4 hours before serving (if making further in advance, keep dressing separate until ready to serve). In a 13 × 9 baking dish, layer the sliced eggplant, overlapping if necessary. Drizzle a little of the olive oil over the eggplant slices and gently toss them to coat. Scatter the garlic over the eggplant. Then place the tomatoes evenly over the eggplant. Crumble the goat cheese with a knife or your fingers and top the tomatoes. Then place the basil on top. 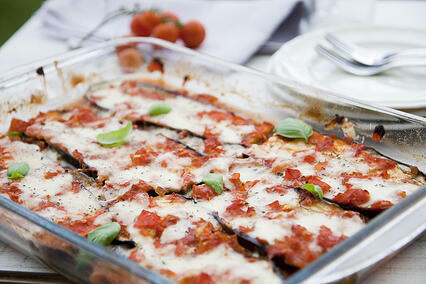 Bake 35–40 minutes, or until the eggplant is softened and the cheese is slightly melted. Serve hot. Farmers’ markets are opening soon, so take advantage of fresh and local produce to come up with your weekly meal plans! Challenge yourself each week to try a new fruit or vegetable and base a meal around that choice. Have fun! 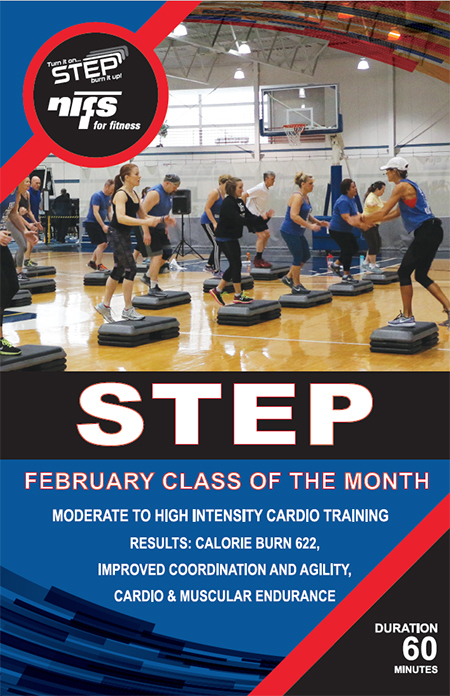 This blog was written by Rachel Pfeiffer, ACE and AFAA Certified Group Fitness Instructor, and proud NIFS Step instructor since 1999. What is the most feared and most skipped gym day of the week? Nearly every person despises it, and few survive it. Yes, you guessed it. I am referring to the infamous “leg day.” However, even if you can endure training your legs, how beneficial is it if you aren’t training your hamstrings correctly, efficiently, and according to their full potential? The hamstring is a large group of muscles (the biceps femoris, semitendinosus, and semimembranosus) located on the posterior side of the upper leg. They have two main responsibilities: flexion at the knee (pulling the ankle toward the glutes) and extension at the hips (pulling the ankle back toward the glute while maintaining a stiff leg). Therefore, the hamstring’s main goal is to balance out the action of the large quad muscles on the front side of the leg, assisting the knee in stability. A standard leg day, as one could imagine, might include the leg press, back squat, leg extension, leg curl, and perhaps a lunge variation. If that’s the case, there is simply not enough emphasis on posterior leg development. We naturally experience quad dominance simply because we are human and the majority of our daily movement requires being in a squat or quad-dominant position. This includes daily functions such as sitting and standing up out of a chair or car. The issues arise when the quadriceps overpower the action of the hamstrings throughout a certain range of motion or movement pattern. This can often happen when walking or running, but it occurs mostly when it comes time to execute cutting, jumping, and landing mechanics. Simply put, athletes across most major sports have below-average hamstring development. This goes for every individual on the planet as well. It becomes a rather large issue and argument for some injuries that these athletes typically encounter. If you are looking to improve hamstring strength, there are several exercises you could add to your workout program. However, I’m here to tell you that there are also a few common mistakes that could be holding you back from reaching your full potential. Wrong timing: The first mistake is that you are most likely waiting to train the hamstring until the end of your leg workout. Ultimately, you should program hamstring-specific exercises. Incomplete range of motion: Secondly, it is quite possible that you might not be completing the full range of motion when targeting this muscle group. Not enough time under tension: The final common mistake is that when performing the movement pattern, you are not spending enough time under tension for that muscle to respond and grow. So a tip would be to use a tempo count where you control down and explode up each rep. If you’ve learned anything from the last five minutes of reading this article, I hope it is the importance of training the posterior chain, especially the hamstring. Not only is it aesthetically appealing, but the with strong hamstrings, functionality and safety of young athletes should be at an all-time high. So jump in and do those leg curls! How many times have you had every intention of heading to the gym either before or after work, only to be deterred by nagging back pain? Maybe you woke up feeling stiff and sore, or maybe you had a long day at work and had a flare-up of pain. Either way, you’re far less motivated to be active when in pain, which quickly turns into a slippery slope. Pain is often a signal that something is not right, and your body will likely encourage behaviors that relieve your pain or prevent it from worsening. If your pain increases with movement, the likelihood of you working out becomes very low. The less you move, the better you feel, and voila, your back pain “magically” goes away! How long will that last, though, until yet another flare-up digs its claws painfully into your spine? Unfortunately, we have yet to discover a sensor for detecting such episodes, but in the meantime we can do everything possible to prevent it from happening. The first step has to incorporate some semblance of movement. I can’t tell you how many times I’ve had a client come to me with a flare-up of pain. Virtually every single time, there is a significant reduction in pain after simply taking some really good breaths and/or actively moving through a safe range of motion. “My back was really achy/stiff/tight/sore/etc. when I came in, but now it feels great!” Some version of this is music to my ears, because now that individual is likely to be far more motivated to complete the workout. 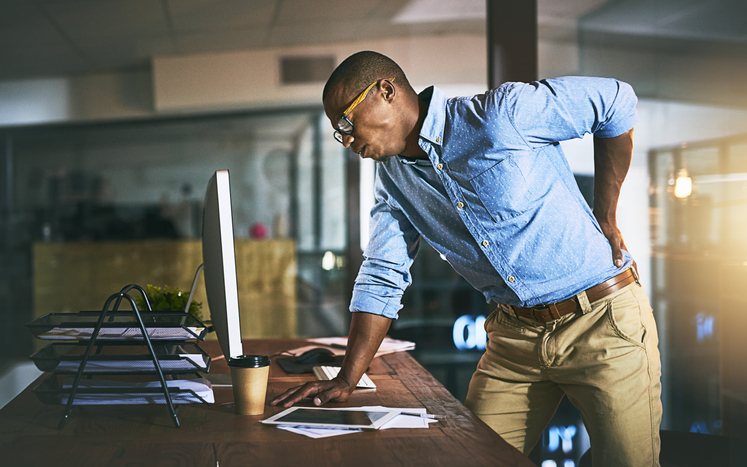 To know exactly what movements or warm-up activities you should be doing, the first step should be to determine whether your pain is something that is chronic (more than a week or two), or extremely severe. In either case, you might need to seek a trusted physical therapist or other healthcare professional to dig a bit deeper into your pain. However, if you’re simply in need of a consistent routine to optimize your warm-up, there are three main activities that can benefit virtually any generally healthy gym-goer. Lie on your back and place your feet flat on a wall, or place your heels on a box of appropriate height. Your knees and hips should be bent to 90 degrees, as pictured. Lift only your tailbone, keeping your back flat against the surface on which you’re laying. Visualize tucking your tail between your legs, as though you are a dog that just got in trouble. You should feel your glutes and hamstrings engage. Holding this position, fully exhale through your mouth so as to push your ribs down into your back. You might place your hands on your ribs to better feel them lowering as you exhale. You should feel a very strong contraction in your abdominals, especially on your sides. After a full exhale, lightly inhale through your nose, keeping your ribs in the “down” position that you achieved after your exhale. Your goal is to maintain the engagement in your abdominals as you breathe in through your nose. Repeat this for 4 to 5 full exhales, and do 2 to 3 sets overall. KEY POINT: The first priority here is to be in the correct position. If the body parts aren’t aligned properly, the muscles you want to be working won’t have any leverage to work. Feeling your hamstrings and glutes engage along with your abdominals, particularly on your sides, is a good sign you’re in the right position. It’s also entirely possible that you could be in the correct position, but not “feel” either of those areas working. That’s okay, just keep practicing and you’ll start to feel it soon. It never hurts to take a video of yourself just to double-check. Start on your hands and knees, with your palms directly under your shoulders and your knees directly under your hips. Tuck your tailbone between your legs, as though you are a dog that just got into trouble. Push your palms through the floor or table to spread your shoulder blades, opening up some “space” in your upper back. Your spine will have a moderate curve to it, as pictured, and you should feel your abs around your ribs engage. Holding this position, exhale fully out of your mouth as though you are fogging up a mirror. Pause for a moment after you finish exhaling, note the activity in your abdominals, and inhale through your nose, keeping your abdominals engaged by pulling your ribs up into your spine. KEY POINT: Avoid shrugging your shoulders toward your ears as you push your palms through the floor. You also want to make sure you’re not using those 6-pack abs (rectus abdominus) in this activity. You want to be focused more on the abs attached directly to the ribs, on the sides of your belly. There’s a time and a place for the 6-pack abs, but this is not one. Start on hands and knees as in the Hands and Knees Rib Lift. Bring one foot forward and to the outside of your hand on the same side. Keep your forward foot flat, and take your hand on that same side up to the ceiling, reaching long through your fingertips. Fully exhale through your mouth as you reach up to the ceiling, inhale through your nose while reaching, then return to start. Repeat 8 to 10 times with each arm and leg. KEY POINTS: Make sure you’re reaching straight up to the ceiling. Don’t rotate for the sake of rotation. Reach long through your fingertips as high as you can while you’re pushing away from the floor with your support arm. Try these out the next time you have some soreness or stiffness coming into the gym. Even if you don’t, these three activities will very much set the tone for your entire workout if performed properly. As always, if you’re unsure, just ask! Any one of our trainers will be happy to help you out, or find the person who can. This blog was written by David Schoch, CSCS, FMS, and Healthy Lifestyle Coordinator. To find out more about the NIFS bloggers, click here. So often in life people like to look at things as win or lose. But what if you switched your perspective to thinking of making progress by winning each day? With this simple shift, your days can be filled with more positivity and success instead of the typical mindset of losing or not being good enough. After you complete the test and track your results, set attainable goals in your mind. Maybe you want to increase each number by 3 to 5 reps a month from now. That doesn’t sound too bad, right? We often set ourselves up for “losing” or “failure” by creating goals that aren’t realistic. The chance of winning the lottery in your lifetime is expected to be 1 in 175,000,000. If you set up your goal to win, how much money would you lose trying to buy all the lottery tickets just to achieve this goal? You might argue that the lose outweighs the win. The same is true in fitness training. People often think that doing more will get them to their overall desired results, but often this approach burns them out quickly, making the overall goal not attainable, and they give up on it after a short period of time. If you set yourself up to start at the bottom and slowly add each time you work out, you will notice progress at each session. With new growth comes new excitement. Aim for progressing in your workouts for a daily feeling of winning, instead of an overall outcome of burnout and losing. Proper form leads to winning longer! Practicing proper form can be a huge challenge for many people. Slowing down in general can get uncomfortable, but breaking out of your comfort zone can reduce injuries and lead to success in your fitness progress for a longer duration. When you practice quality in addition to your quantity goals, you are making double the progress. Have you ever asked a trainer to take a look at some of your basic movements, like a pushup or squat? A lot of details go into these exercises without weight that you might not even realize, let alone the additional details you need to think about when adding weight. A Functional Movement Screen might be a great way to receive feedback about your form to help give you additional knowledge and tools for personal fitness growth. People often forget about the importance of recovery and how it actually allows us to win. Without allowing the body time to heal, you are putting negative strain on the body and brain, leading to not just physical injuries but also a lot of stress and anxiety, which also spirals into even more problems such as future disease. Being mindful of how much stress you put your body under and balancing it out with how well you recover with days off, diet, and foam rolling and stretching is a huge fitness bonus! Humans have the ability to become and remain stable throughout any movement, from walking, to lunges, to power cleans. Increased stability typically correlates with increased performance. There are countless methods, tools, and tricks of the trade to find and keep stability, and one that I think provides so many benefits at any level of fitness is the marching pattern. No, that is not a typo; marching is exactly what I mean. You know, that movement you see members of the band doing at halftime. Marching, at its core (I meant to do that), creates stability just when you get into the marching position. Then you can increase the results by changing your body position and adding load to make it a hugely effective exercise for increasing stability. It’s a fundamental movement that can be done at any age. Marching can serve as a lead-up to so many more advanced movements. It creates stability on both sides of the body (hip flexors and glutes). Marching develops balance while increasing core stability. The exercise helps the aging athlete avoid shuffling when walking, which can lead to falls. It helps increase performance in single-leg movements. Stability equals strength, and we can all stand to be stronger in the movement patterns that are huge parts of our lives outside of the gym. Add marching to your program to be "life strong,” and enjoy moving for a lifetime. This blog was written by Tony Maloney, ACSM Certified Exercise Physiologist and Fitness Center Manager. To find out more about the NIFS bloggers, click here. Daylight Saving Time is coming, and with that we lose an hour of sleep. Studies have shown that the week following springing forward, car accidents increase by 20 percent. Cardiovascular events also increase, with a 24 percent higher incidence of heart attacks the Monday following Daylight Saving Time. In addition to an increase in accidents and heart attacks, people are also suffering from not only losing that one hour of sleep from Saturday into Sunday morning, but for up to a week Americans can lose 40 to 50 minutes of sleep per night due to their sleep/wake cycle being thrown off. One of the main excuses people give for skipping breakfast is time. Now add in almost an hour of lost sleep, and that week following Daylight Saving could be a week of running late and missing breakfast, or the temptation to stop at the drive-through lane. Instead, here are some quick and easy breakfasts that can be useful for Daylight Saving or anytime throughout the year. In a large mixing bowl, beat eggs. Add remaining ingredients and mix together. 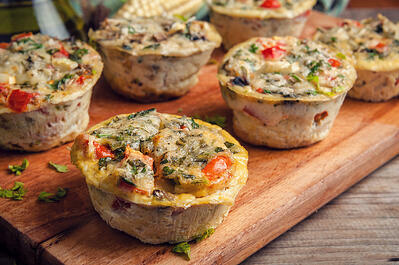 Scoop ⅓ cup of mixture into each muffin cup. Bake 20–25 minutes or until the center of the muffin is completely cooked. Preheat oven to 375 degrees and grease a 9 x 13-inch pan. Melt butter in skillet and add oats. Stir until lightly toasted. Put oats in a large mixing bowl and pour boiling water over them. Add apples, cinnamon, brown sugar, and salt and stir until combined. Add milk and stir. Pour into prepared dish and bake 50–60 minutes or until browned and set. Stir oatmeal before serving and then add toppings as desired. Blend the oats until a fine powder forms, then add all remaining ingredients and blend until smooth. Drink immediately, or store in a covered container in the refrigerator if you make the smoothie the night before.